Volunteers are a crucial part of our organization! We rely on volunteers to carry out our programs as well as help with our community events. 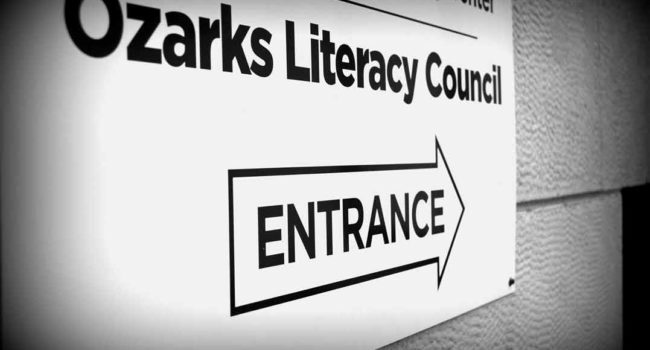 There are numerous ways you can get involved with the Ozarks Literacy Council. Read through the various opportunities to find the one that fits you best! Volunteer tutors make the mission and vision of OLC a reality. Teaching someone to read requires perseverance, patience, and the caring flexibility to work at the speed of the student. Although the experience can be challenging it is also just as rewarding for the tutor as it is for the child or adult learner. Tutors attend a one day training prior to being matched with a child or adult. All materials for the tutor and student are provided. For information on changing a life through tutoring, click here. Volunteers donate their time to read to a classroom 4 times during the school year. OLC provides these reading activities and books to 63 preschool classes throughout Springfield Public Schools. Introducing literacy at an early age sets the students up for success later in life. These interactive visits have prepared lesson plans for volunteers, a fun book related activity and provides a free book for each child. Each visit takes about 30 minutes. No training or prior experience is required. Pizza Bowl and Trivia Night are OLC’s most exciting Special Events! Up to 30 volunteers are needed per event to help at these events doing tasks such as ticket sales, silent auction assistants, and so much more! Additionally, OLC works to get books in the hands of children by giving away free books at Community Events such CandyLand on C-Street, Back to School Bash, River Jam and more. We are always in need of outgoing volunteers who would like to help give out books and promote OLC programs. If you enjoy a hands-on experience, OLC would love to have your help! Check out more information on events page. To download and fill out the volunteer data form, click here.